I’ve waited a long time to write those words. 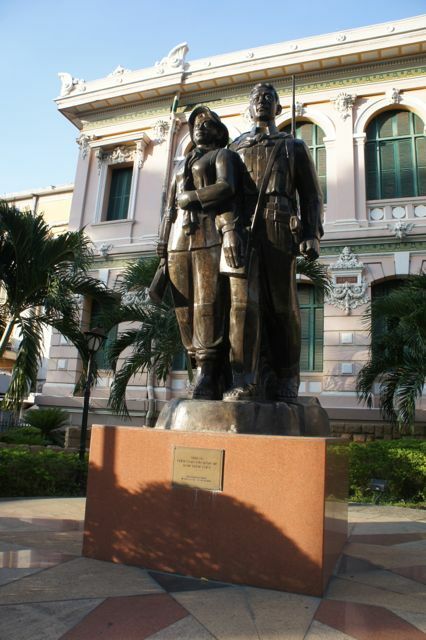 Now that I’m in the Caravelle Hotel in Ho Chi Minh City , better known as Saigon, it’s a legitimate comment. Look, I thought Vietnam was a huge rice paddy but please understand Saigon is as big as, as busy as, as chic as, as crowded with traffic as Los Angeles, Dallas, London, New York, and it has all the skyscrapers to boot. Here though communism-socialism is the philosophy, business is business and everyone is going about it. The airport is enormous. One is greeted by a Burger King at the airport, although I’m quickly advised there is no McDonalds, but that KFC and Starbucks are opening shop soon. In downtown’s center, within one fancy block or two are four corners of the hot upper end stores: Chanel, Burberry, Versace, Cartier, etc. Huge spaces, not anyone shopping in them, seems to me. I had to see if Burberry had any scarves I hadn’t seen. 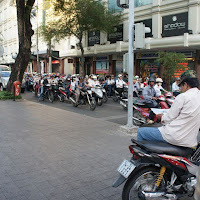 Streets are so crammed with motorcycles (everyone wears helmets and many wear face masks against pollution) that to cross a street you throw your fragile life to the winds. There are 35 accidents a day just on motorcycles. Motorcyclists are supposed to go around you as you slowly take one more step toward safety. Jade, our guide, a thin young girl who has three jobs and wants you to know that things have changed for the better in the past ten years, leads us through the traffic like a mother hen would her chicklets. Of course the first thing I wanted to see was the CIA building (not the US Embassy, as so many of us have been badly informed) at 22 Ly Tu Trong where the helicopters rescued a line of people, recorded in a photograph that grabbed our imagination in those days ending the Vietnam War in the 1970s. However this icon is about to be torn down. Green glass structures are surrounding it. The old structure looks raggedy in front of modernism. A time gone by. Remnant of a war we had no business being in and that had no favorable ending. In fact, after killing our men and theirs, and tearing up the unity of our own nation (protests became a big deal) Communism moved in easily and has thrived even as their cities become more commercial. Now Saigon (Ho Chi Minh City) is big time big bucks place so jammed with 5 million 300 thousand motorcycles and scooters that it’s almost comical. I was told that there are 32 million motorbikes in the country, and only two bikes allowed per family. But at rush hour, thousands cram into one block waiting for the lights to change. Every street light has that count down system so the motor revving won’t get too anxious. Another note, no guns are allowed at home. In fact, police use rubber bullets and only the Army can have real ones. If a soldier shoots at someone and fails to capture him, I was told, then the solider has to pay for the bullet lost. Oh well. Maybe that’s a solution, rubber bullets. All the scary guns used in wars are locked up in cases in museums. If someone is found with a gun, off for a long jail sentence. 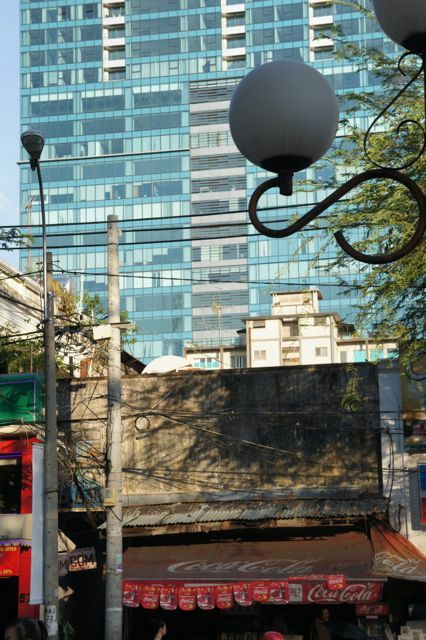 My hotel is one of the three renowned hideouts of press and military during the Vietnam War - Caravelle, home of the Saigon Saigon Bar, where CBS and ABC set up shop and a bomb exploded on the fifth floor in 1964. I’m on the 8th floor. The others within a large square are Rex Hotel (headquarters for American bachelor officers and the daily press briefings were called “5 o’clock Follies) and the Continental (where Graham Greene and Somerset Maugham squeezed out stories). Close by on wide boulevards lined with kapok and tamarind trees, is, at last, the Notre Dame Cathedral, designed and built by Gustav Effiel’s firm, which doesn’t pretend to be as majestic as the Paris original, and has beefed up its Chartres stained glass windows by putting neon haloes on the saints and holy folk. Tourist were not allowed in during the mass, but, being of the Catholic family, I was let in because I wanted to pray - particularly for those affected by the Boston Marathon Bombings, for the law enforcement looking for the culprits, and for my own family. There was a chanted mass going on which as best as I could figure it out was being led by a group of women, but, of course, it was in Vietnamese language. 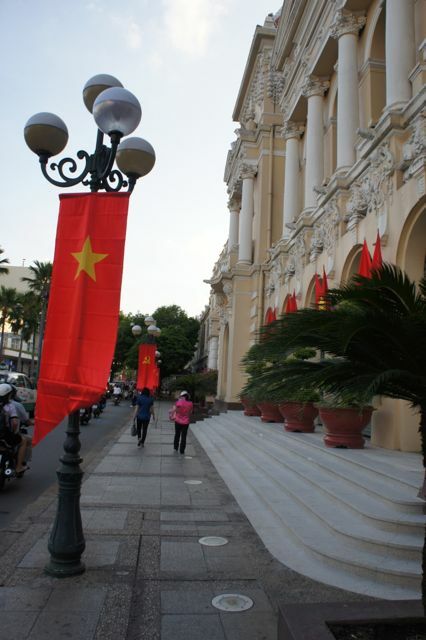 Catholicism is on the rise in Vietnam and there are churches and cathedrals throughout. 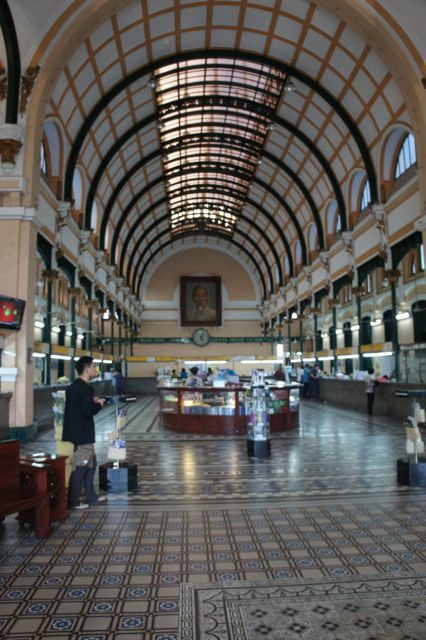 We then wandered to the post office, which is so ornate it looks like a Russian train station, and bought some old Vietnam stamps, then dodged motorcycles again getting back to the hotel for a seafood buffet dinner that restored all the protein I’d been lacking. But I must take you back earlier this day in Cambodia where we had the rare invitation to visit with Dr. Damian Evans, an expert in Khmer archaeology and professor at University at Sydney, Australia, to visit “behind the scenes” of the largest storehouse of Khmer sculpture in the world - the Conservation Warehouse. 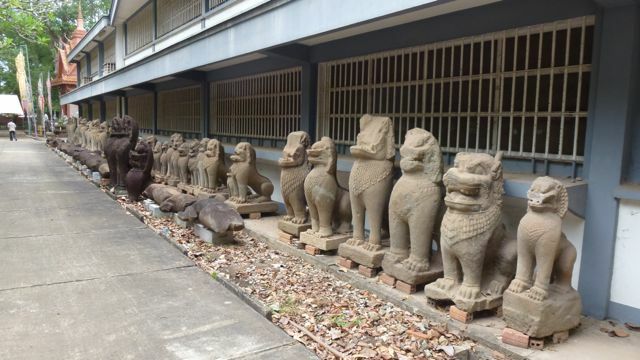 There are over 10,000 sculptures and pieces rescued from smugglers or removed from the Angkor temple sites at this location, mostly behind steel bars. There are so many Divas and Demons = the Diva heads have sort of a square hat, the Demons, the weird curly triangular crowns. The Divas with hints of smiles, the Demons with frowns. I was allowed to take photographs freely, but the spirituality of being among so many sacred stone fragments, even torsos that looked almost Grecian, and growling lions, and giant monsters and gods as big as Colossus of Rhodes, it seemed, kept me in silent awe. Some I gentle touched knowing they had been around a lot longer than I had, and would be here when I’m gone. There are vibes in stones if you know their history. There is so much to be discovered and people like Dr. Evans is trying to do just that. Dr. Evans’s main project is mapping through lazar readings from helicopters, roads and remnants of the many areas of the jungle within the Angkor estate which have not yet been developed, although found. There are well over 1000 sites discovered and not yet restored. 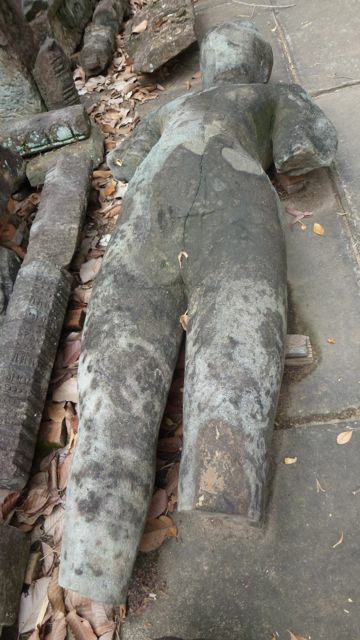 Meanwhile copies of stones and statues are being made and aged at the center and will eventually be used to replace the originals removed or stolen and missing pieces in the temples so people will know what should be there. Tourists still try to chip out a Buddha or a naga (snake) head to earn a buck. A horrible thing, to mess with history. But Dr Evans has an amazing project and is extremely informative about each and every piece. This was a privilege for anyone who has ever considered archeology as a career or studied art history. 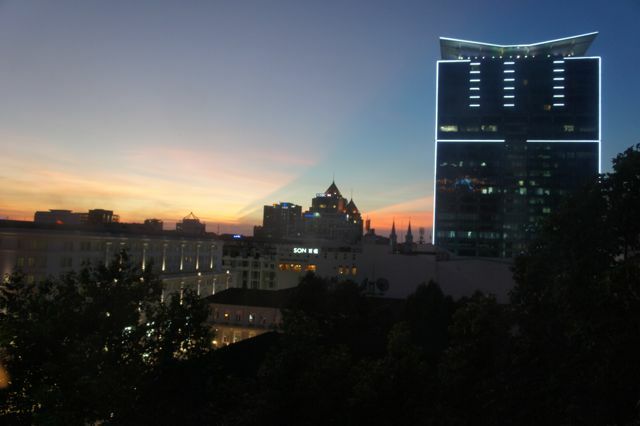 Saigon must be a beautiful metropolis. The buildings you photographed are impressive. 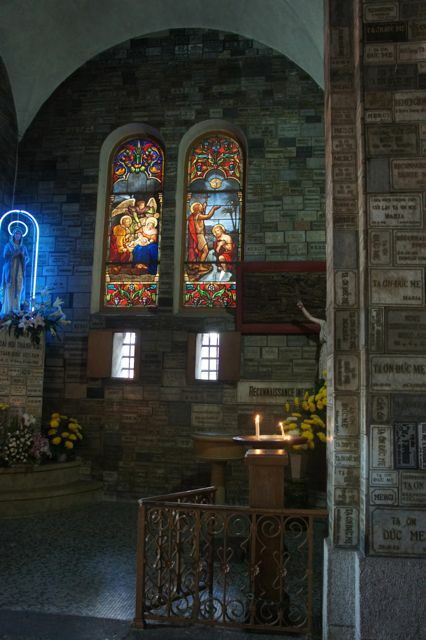 Since we visited Notre Dame Cathedral in Paris and the Cathedral in Chartres, the part of your blog about the Notre Dame Cathedral in Saigon was special. The Chartres stained glass is beautiful. The gang returned from Atlanta last night. They said there were over 1000 attending the conference and the sessions were informative. Enjoy your weekend. God bless you.